Yellow jackets are incredibly common in Knoxville. Recently, the Critter Wranglers team took care of a massive yellow jacket infestation in our client’s HVAC vent in an apartment complex. The tenant had yellow jackets coming into their home from openings around the HVAC vents on an upper level of the complex. We had to take extreme care in treating the yellow jackets without getting any insecticide into the HVAC ductwork. We removed the nest from the attic after we determined that the insects were dead so that we could be certain they were all gone. We then sealed the holes they were using on the exterior of the building as entryways to prevent future problems from occurring in the same spot. Because yellow jackets are so common in our area, people generally just see the insects coming and going on the exterior without giving much thought to what’s going on inside the home. That’s why today, we’ll look at some of the most important characteristics you should know about yellow jackets, which can help you prevent them from nesting in your home and you identify a yellow jacket problem when one occurs. Yellow jackets are a species of wasp that are highly active in the spring, summer, and fall before they go into hibernation for the winter. Yellow jackets are carnivores that feed on other insects like flies to get their protein and support larvae in their colony, which makes them quite helpful in keeping pests away from your garden. When the temperatures drop in the fall, however, they begin scavenging for food when their food source dies off with the cold. They will look for food wherever they can find it, including trash cans, bird feeders, and in your home. The trouble with yellow jackets is that they are incredibly territorial and may become aggressive to anyone or any pet that appears as a threat to their colony. Yellow jackets feature the characteristic yellow and black stripes on their body segments. Some, however, have white and black stripes. They are small in size, usually measuring between 10 and 16 millimeters in length. They have a thin waist between their main body segments, which is one way to tell them apart from a bee. Yellow jackets have long wings that run the length of their body, which fold laterally when they aren’t in flight. Yellow jackets typically nest in the ground, often building their nests in rodent dens. They love taking up residence in parks, wooded areas, and yards in both residential and commercial properties. It is when they nest in close proximity to homes, multifamily housing units, and businesses that they find their way into these structures. 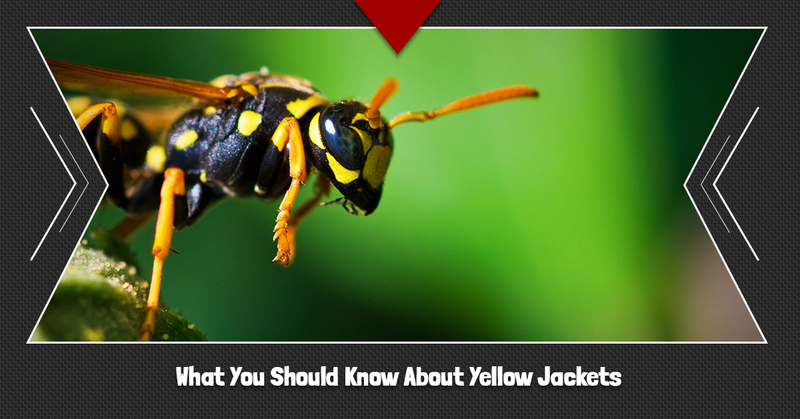 Yellow jackets are incredibly smart and can find their way into any building when they want to. Since one of their favorite locations to set up a colony is in yards, this puts them in a close distance to things that attract them when they’re scavenging, including trash cans, sheds, garages, doors, windows, and other openings on a home such as vents and cracks. These pests also build nests in the soffits beneath the roof, which puts them close to bedroom windows. As we found in the recent case with the apartment building, yellow jackets can build their nests in HVAC vents and ducts, which can damage the components of these spaces. They can also compromise the insulation in attics. Since they frequently colonize yards, you may find small openings in the ground, which can make your yard look patchy. More importantly, they sting, which means people and animals tend to step on them when walking in their yard. What’s more, they can harm people and pets when they feel threatened and become aggressive to protect themselves and their colony. Avoid leaving clutter in your yard. Keep trash cans away from entryways and windows and always keep them tightly sealed. Avoid drinking sweet beverages outdoors. Leave off the lotions and perfumes when spending time outdoors. Clean up spills, even on the patio, grill, and patio furniture. Clean up spilled pet food in the garage and outdoors. Keep pet food stored in an airtight container. Take extreme precaution when enjoying time in your yard where yellow jackets live, and take extra precautions if you have allergies to bees. If you get stung by a yellow jacket, reduce the pain and swelling by icing the affected area. If you get stung in the mouth or throat, this could cause potentially serious health problems, so seek medical attention immediately. Yellow jackets are not creatures you want to mess with. They are highly aggressive, territorial, and dangerous, and can become a real threat to you, your family, and your pets. If you suspect you have a yellow jacket nest in your yard or somewhere in your home, you’ll want to remedy the situation immediately. That’s where we come in. As you can see from our recent yellow jacket removal, there is no yellow jacket nest too big or too small for us to handle. When you need yellow jackets removed from your home, call Critter Wranglers, the Top Rated Local® pest control and removal experts in Knoxville. We will take extra care to safely remove all the yellow jackets and their nest from your home. We can prevent them from coming back with monthly pest control service and pest prevention methods. Call us to get a quote and take back your home from these stinging pests! Want to learn more about our wildlife removal, attic restoration, and animal proofing services? Follow the links or call us to inquire about these and other services.